Currently pending before the Supreme Court is a case arising out of – where else? – Texas, challenging that state’s draconian 2013 laws restricting access to abortion. The case is called Whole Women’s Health v. Cole, and it presents the greatest threat to the ongoing viability of the right to abortion since the Casey decision in 1992. In Casey, three justices stitched together a plurality opinion that, quite literally, saved Roe v. Wade from being overturned. Of those three justices, only one – yes, attention hog Anthony Kennedy, again – remains on the Court. The key to comprehending the Supreme Court’s ruling today in Gonzales v. Carhart upholding the federal partial-birth abortion ban is a mastery not of constitutional law but of a literary type. Justice Anthony Kennedy’s majority opinion is less about the scope of abortion regulation than an announcement of an astonishing new test: Hereinafter, on the morally and legally thorny question of abortion, the proposed rule should be weighed against the gauzy sensitivities of that iconic literary creature: the Inconstant Female. Kennedy invokes The Woman Who Changed Her Mind not once, but twice today. His opinion is a love song to all women who regret their abortions after the fact, and it is in the service of these women that he justifies upholding the ban. Today’s holding is a strange reworking of Taming of the Shrew, with Kennedy playing an all-knowing Baptista to a nation of fickle Biancas. And then Kennedy quickly returns to the business of grossing us out. With a stirring haiku about how “respect for human life finds an ultimate expression in the bond of love the mother has for her child,” the justice interpolates himself between every one of those mothers and every child she might ever bear. Without regard for the women who feel they made the right decision in terminating a pregnancy, he frets for those who changed their minds. (“It seems unexceptionable to conclude some women come to regret their choice to abort the infant life they once created and sustained.”) (The “infant,” not the “fetus.”) As both the dissenters and my colleague Emily Bazelon have pointed out, this portrayal of a rampant epidemic of regretful women may or may not be scientifically accurate. (The American Psychological Association doesn’t think so.) But even if the numbers of women who would truly choose differently if they could choose again are larger than most of the medical literature indicates, one might question whether such women should be the pole star of national abortion policy. While particularly infuriating in the context of that case, Kennedy’s analysis is characteristic of his jurisprudence. He sees himself as a protector. It’s what led him to many of the decisions that are hailed as pathbreaking on LGBT rights. But with women, he clearly has more than a little of the “ick, girl cooties!” about him. Amici are lawyers who have obtained abortions and who have participated in a wide variety of different aspects of the legal profession, including at private law firms, corporations, multinational governmental organizations, nonprofit organizations, and law schools. Amici care deeply about the reproductive rights this Court has recognized—in Roe v. Wade, 410 U.S. 113 (1973), Planned Parenthood v. Casey, 505 U.S. 833 (1992), and elsewhere—as constitutional entitlements. And Amici believe that, like themselves, the next generation of lawyers should have the ability to control their reproductive lives and thus the opportunity to fully participate in the “economic and social life of the Nation,” as promised in Casey. 505 U.S. at 856.
in the United States (July 2014), http://www.guttmacher.org/pubs/ fb_induced_abortion.html (last visited Jan. 3, 2016). The testimonials in the body of the brief are heartfelt and real. They’re not about esoteric legal concepts – they recount real world decisions with enormous personal consequences. For the individual women, they were life-changing. For our society as a whole, multiplying these individual stories out a million or ten million times over, they’ve been transformational. You want to know what will happen if the right to an abortion is abandoned? Read the brief. I’ve reproduced below the “Summary of Argument” section of the amicus brief. It’s targeted at Anthony Kennedy, who wrote the “ability of women to participate equally in the economic and social life of the Nation” language. He’s enough of an elitist that stories from his own profession will appeal to him. And he loves being called on to rescue people in need. But as screwed up as he is, he may be the only hope for the survival of Roe and Casey. This brief is intended to inform the Court of the impact of the right this Court has recognized in Roe, Casey, and elsewhere on the lives of women attorneys, and, by extension, on this nation. As this Court held in Casey, a woman’s right to terminate a pregnancy necessarily follows from her “dignity and autonomy,” which are “central to the liberty protected by the Fourteenth Amendment.” Casey, 505 U.S. at 851. Amici live and practice across the country, including in Texas, and hail from diverse backgrounds. Amici are partners, counsel, and associates at private law firms; they are government attorneys, a former state legislator, and public defenders; they are members of legal service organizations and law school professors; they are counsel to corporations, universities, and foundations; and they include several attorneys who have argued before this Court or authored briefs submitted to it. Many Amici are former federal and state judicial clerks, and two Amici were judges themselves. Amici have achieved considerable professional success; among them are a MacArthur Fellow, published authors, former editors-in-chief of leading law journals, and former academic deans. Many are mothers, and some are grandmothers. For all Amici, meaningful access to reproductive choice allowed them to become, remain, or thrive as lawyers. Amici write respectfully to urge the Court to overturn the Fifth Circuit’s decision at issue here. That decision, if affirmed, would have the very real effect of preventing numerous women, including many current and future attorneys, from effectively planning their family and professional lives. The legacy of this Court’s decisions, in Roe, Casey, and others—specifically, women’s full participation in economic and social life—has enriched not just individuals like Amici, but this esteemed profession, and our nation itself. Short version: either women get to participate fully in their own lives, and in the affairs of our country, or they don’t, and they’re second class citizens. We’ll find out where Justice Kennedy stands on the issue in a few months. Without expressing any view on the merits of petitioners’ claim, we believe it easily clears Goosby’s low bar; after all, the amended complaint specifically challenges Maryland’s apportionment “along the lines suggested by Justice Kennedy in his concurrence in Vieth [v. Jubelirer, 541 U. S. 267 (2004)].” App. to Brief in Opposition 44. Although the Vieth plurality thought all political gerrymandering claims nonjusticiable, JUSTICE KENNEDY, concurring in the judgment, surmised that if “a State did impose burdens and restrictions on groups or persons by reason of their views, there would likely be a First Amendment violation, unless the State shows some compelling interest. . . . Where it is alleged that a gerryman- der had the purpose and effect of imposing burdens on a disfavored party and its voters, the First Amendment may offer a sounder and more prudential basis for intervention than does the Equal Protection Clause.” Vieth v. Jubelirer, 541 U. S. 267, 315 (2004). Whatever “wholly in- substantial,” “obviously frivolous,” etc., mean, at a minimum they cannot include a plea for relief based on a legal theory put forward by a Justice of this Court and uncontradicted by the majority in any of our cases. Accordingly, the District Judge should not have dismissed the claim as “constitutionally insubstantial” under Goosby. I was an appellate law clerk here in Maryland and I’ve been doing appeals my entire career. When an appeals court sends a case back to a lower court on procedural grounds and finds a way to address the merits of the case, that’s a total giveaway. Scalia is sending a clear message to the three judge panel who will hear the case that this is a legitimate claim that needs to be taken seriously. You hear that ringing noise in the distance? That’s the death knell for Maryland’s 2011 redistricting plan. It just got a whole lot louder this morning – let’s watch and see what happens. This was a big first step in the right direction, not just for Maryland but for the entire country. The Supreme Court on Friday decided to hear its first major abortion case in nearly a decade, agreeing to determine how far states may go in regulating the procedure without violating a woman’s constitutional rights. It will be one of the court’s most consequential rulings on the morally and politically divisive subject, and it will land just months before Americans choose a new president. The divide over protecting the unborn and safeguarding the right of a woman to choose is among the starkest differences between the Republican and Democratic candidates. Numerous states have enacted restrictions that lawmakers say protect a woman’s health but abortion providers contend are merely pretext for making it more difficult to obtain an abortion or even making the procedure unavailable within a state’s borders. The court agreed to review a sweeping law from Texas. Abortion providers say full implementation of the Texas law would reduce from 42 to 10 the number of clinics in the nation’s second-largest state. The court took no action on a case from Mississippi, where a similar law there would close the state’s only clinic if it were allowed to proceed. It was stopped in a lower court. The outcome will turn on an interpretation of the court’s ruling nearly 25 years ago in Planned Parenthood v. Casey. It said states had a legitimate interest in regulating abortion procedures but could not impose an “undue burden” on a woman’s right to terminate a pregnancy before fetal viability. Justice Anthony M. Kennedy is the only remaining justice among the three who wrote the Casey standard in 1992, and he will again be the pivotal justice in deciding whether the state restrictions violate it. 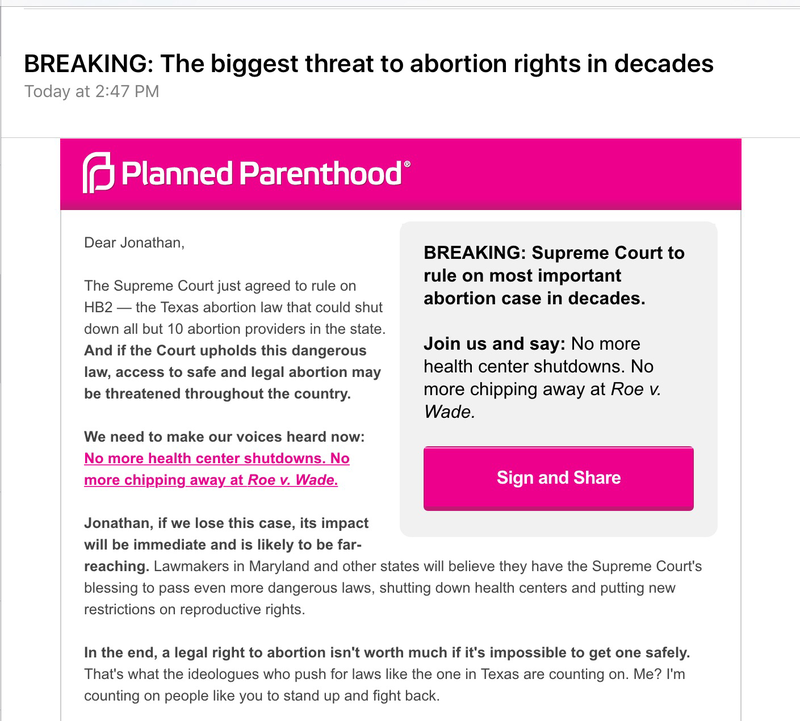 Planned Parenthood, not surprisingly, had a blast email out within fewer than 20 minutes. Here’s the lede. If it is not decided on some narrow ground, this case will ultimately decide how far states can go in regulating access to abortion. The Court has never meaningfully defined the boundaries of the “undue burden” test set forth in the 1992 Casey decision. Watch this case carefully – as in Casey, a woman’s constitutional right to abortion could be on the chopping block in this case. It’s not as quiet and sedate over there at the Court as they’d like you to believe. Here’s a look inside the marble palace. The Notorious RBG with some ’80s rap for you young’uns. With backup singers and everything. The New York Times editorial board lets loose some Independence Day weekend venom at the Supreme Court’s record under Chief Justice John “Balls and Strikes” Roberts, which has now reaches its 10th anniversary. Some recent good news notwithstanding, the verdict is not a kind one. The Supreme Court has been a source of a lot of good news – not on everything – and just within the past half hour comes more, this time on access to abortion in Texas. The Supreme Court issued a brief, two paragraph order on Monday permitting Texas abortion clinics that are endangered by state law requiring them to comply with onerous regulations or else shut down to remain open. The order stays a decision by the United States Court of Appeals for the Fifth Circuit, which imposed broad limits on the women’s right to choose an abortion within that circuit. While the substance of the order offers little insight into how the Court will ultimately decide this case, the final sentence of the order does: “The Chief Justice, Justice Scalia, Justice Thomas, and Justice Alito would deny the application.” Notably absent from this list of dissenting justices is Justice Anthony Kennedy, a conservative who typically votes with his fellow conservatives in abortion cases, but who has also refused to overrule Roe v. Wade outright. The fact that the four liberals voted to grant cert is crucial – on abortion cases in recent years, it had usually been the conservatives seeking to create bad law, and the liberals rarely voting to take new cases in fear of precisely the same outcome. Here, Justice Kennedy was with the liberals in agreeing to take the case, which means there is a very good chance that he sees the Texas regulations as going too far in the direction of overruling Roe v. Wade. More important than what I think is that Sotomsyor, Kagan, Breyer and Ginsburg obviously believe the same thing – otherwise, their vote to grant cert was foolhardy and counterproductive. We shall see.